I love this juice, it’s so delicious and so beautiful! You can’t help but be happy when your drinking such a vibrant colour. This juice is made from Beetroot, Apple, Carrot & Ginger, and is the perfect balance between fresh and sweet. Beetroots are an mazing vegetable to juice as they have a high water content so you get lots of juice! 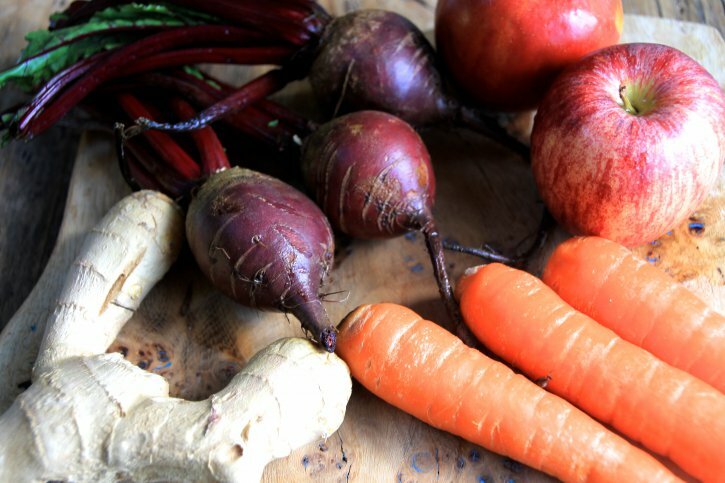 Beet’s are a powerful anti-inflammatory, containing a unique source of Betaine, a nutrient that helps to protect cells, proteins and enzymes from environmental stress. . It’s been shown to reduce internal inflammation, and prevent against numerous chronic diseases, such as cancer and heart disease. Its also been shown to help recovery of muscles and joints. Beetroot is also used to enhance stamina down to it’s wealth of nitrates. 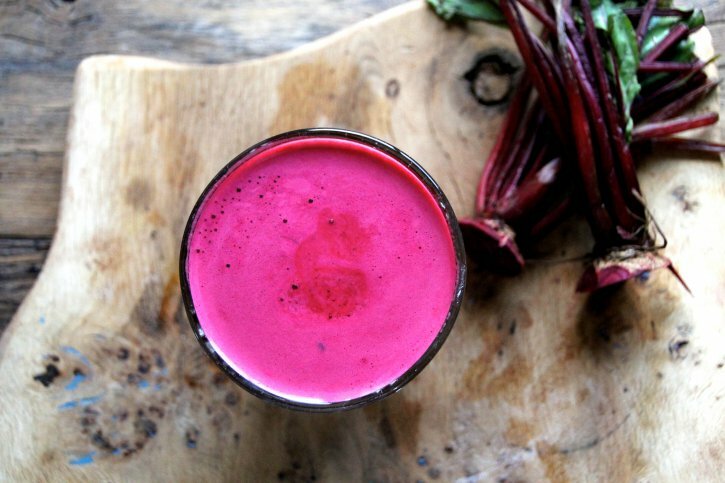 Beetroot’s are also really cleansing and purifying to the blood and liver, supporting the detoxifying process. Carrots contain powerful antioxidants such as Beta-carotene and vitamin C, which also contribute to reducing inflammation in the body. They also contain skin-loving nutrients like silicon which promotes glowing skin and healthy nails. Apples contain an amazing amount of immune boosting antioxidants. Red apples contain an antioxidant called quercetin. Studies have shown that this antioxidant can help boost your immune system, in particular when your stressed out. Ginger: Ginger is one of my favourite things to add to juices as it gives it a bit of fire, a delicious kick that not only enhances the flavours but gives your body a flush of nutrients that are highly anti-inflammatory. This is such a delicious pick me up, perfect for when you need a quick boost of energy! I also love making this juice when i’m injured as it has so many anti-inflammatory benefits for your body. Peal the ginger and the beetroot. Put all the ingredients through a juicer. Mix with a spoon and pour into your glass!